Acupuncture and Depression: Could Acupuncture Help Depression? Many people with depression prefer non-drug therapies to help them manage depressive symptoms. Natural, alternative therapies are viable options for treating mild depression, and they can be used as complementary therapies for mild to major depression. Acupuncture is one such alternative, complementary therapy that may help you to manage your depression. Here is what you need to know about acupuncture, how it can help treat mild depression to major depression, how long before you see relief and how to know it is helping. Acupuncture refers to a variety of techniques for alleviating pain and other ailments and restoring good health. This is done through stimulation of specific points throughout the body with needles, either manually or with electric stimulation. Numerous studies show acupuncture helps to ease chronic pain from a variety of health conditions, including osteoarthritis and headaches. Acupuncture has also been shown to stabilize moods. Acupuncture is linked to the idea illnesses are the result of disruption in the body’s qi – or flow of energy. The belief is acupuncture needles stimulate specific pressure points located under the skin and releases the qi. Today, acupuncture is carried out in healthcare settings is based on more modern and scientific theories. Therapies revolve around the idea acupuncture needles stimulate nerves and send signals to the brain releasing feel-good hormones, and that acupuncture excites biochemical responses through nerve stimulation. The two most common types of acupuncture are manual acupuncture and electroacupuncture. 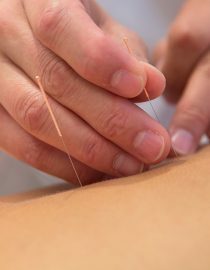 In manual acupuncture, needles are inserted no more than a half inch to an inch into the skin. Very few people experience pain, and most report feeling relaxed during treatment. Any pain means the procedure isn’t being done correctly, and you should let your acupuncturist know right away if you experience pain. Electroacupuncture is similar to manual acupuncture because the same pressure points are stimulated during treatment. The needles are also inserted into the same points as manual acupuncture. The main difference is the needles are attached to a device that produces continuous electrical pulses. The device’s frequency and intensity are set based on the condition being treated. An advantage of electroacupuncture is that the acupuncturist does not have to be exact with the needles because the area stimulated is broader than using one manual needle. Another advantage is that electroacupuncture can be done without needles, such as with the use of a TENS (transcutaneous electrical nerve stimulation) machine. There is growing evidence that finds the use of acupuncture for treating depression can be as effective as using antidepressants. Reuters Health reported on a study out of the University of York in the United Kingdom. The study involved 755 people with moderate to severe depression, 70 percent of who had been taking antidepressants and were continuing them during the study. The UK study found both acupuncture and talk therapy, or a combination was effective in lowering the depression scale for many of the study participants. And the benefits lasted for up to three months after the treatments were concluded. Another study – this one from researchers at the Beijing University of Chinese Medicine – finds acupuncture is effective in alleviating both depression and anxiety. Both manual acupuncture and electroacupuncture were found to be just as useful for mild to moderate depression as the medication, paroxetine, under the brand name Paxil. One double-blind, placebo-controlled study reported in the journal, Psychological Science looked to assess the effectiveness of acupuncture as a single therapy for major depression in 38 women. At the end of the study, 64 percent of the women experienced symptom significant relief from depression. How Long Does It Take for Acupuncture to Work for Depression? Acupuncture is a process, and you will not get symptom relief from one treatment. Most patients don’t need many therapies, but you will need at least one treatment for you and your acupuncturist to determine what you can achieve with treatment. Chances are you will be receiving at least one treatment a week for a period of six weeks to two months. If you do not get regular treatments, you may not achieve the full benefits of acupuncture therapy. Depending on what symptoms you are experiencing, you may notice symptom relief or you won’t. For example, if you experience pain with depression, change will be evident based on pain location, how severe pain is and how intense it is. Your acupuncturist will record your progress to determine if treatments are helping to resolve pain symptoms associated with depression. Sleep problems tend to be associated with more severe depression, but anyone who is depressed can experience sleep problems. Many people report having the best sleep they have ever had after their first acupuncture treatment. Research has shown acupuncture helps reset and regulate the body’s biological clock. And when sleep quality improves, so do depressive symptoms. Relaxing the body allows it to process stuck energy and rid your body of it. Many people report feeling a mood boost as soon as their first treatment. This is because the brain is releasing dopamine and serotonin, two important brain chemicals responsible for improving mood and reducing depression. It is possible you may notice you have more energy as soon as you finish your first treatment. Acupuncture will also help your body perform at its best and to repair itself faster. Research shows acupuncture can be useful for lessening the symptoms of depression. It can be a viable alternative for people unable to take antidepressants or for those who have not gotten relief using them. You have nothing to lose by giving acupuncture a try. Even if it doesn’t resolve your mood symptoms, it may help manage pain, fatigue and give you a much-needed boost of energy.